Chart Studio offers free, online tools for analyzing data and making graphs. 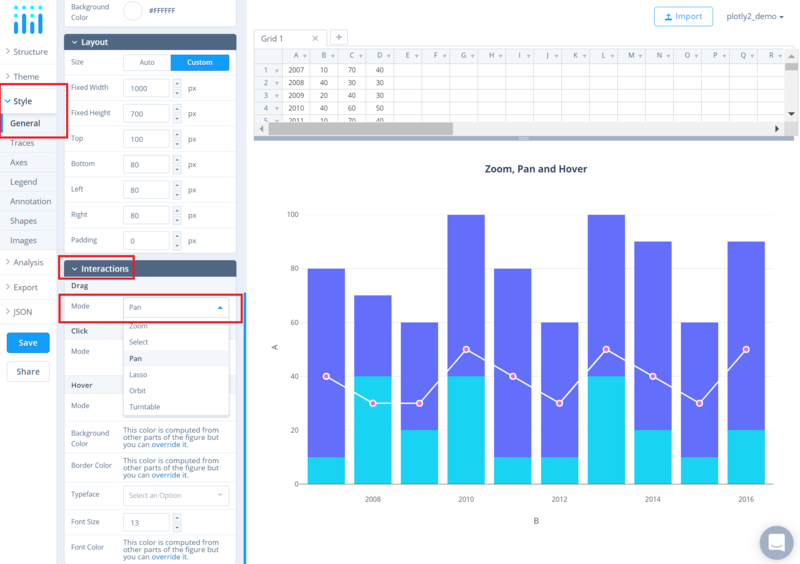 You can bring your graphing and data analysis to the next level with zoom, pan, and hover. Autoscale/Reset axes via Mode Bar. Make sure to check out our other tutorials! 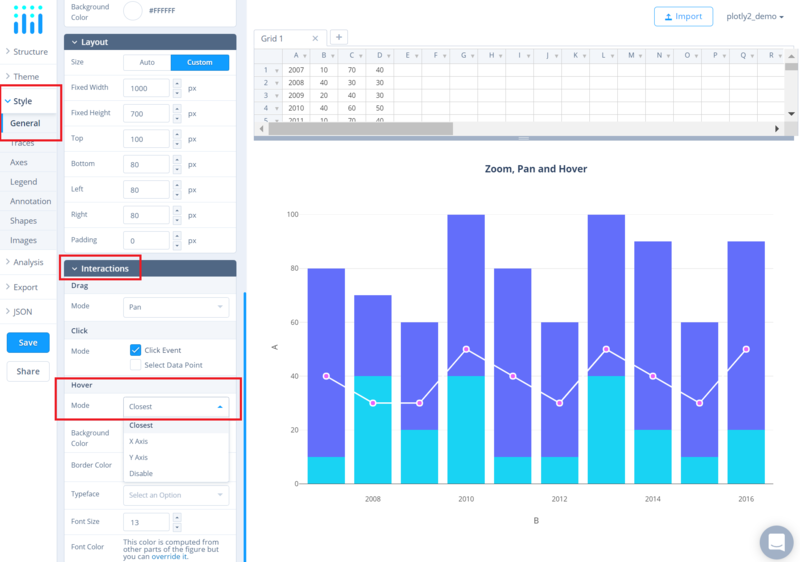 Before getting started with your own dataset, you can use the data featured in this tutorial by clicking on 'Open This Data in Chart Studio' on the left-hand side. It'll open in Chart Studio. If the plot's drag mode is set to 'Zoom', click and drag on the plot to zoom-in and double-click to zoom-out completely, i.e., autoscale both the axes. To zoom along only one axis, click and drag near the edges of either one of the axes. Additionally, to zoom-in along both the axes together, click and drag near the corners of both the axes. If the plot's drag mode is set to 'Pan', click and drag on the plot to pan and double-click to reset the pan. Please note that, by default, the plot's drag mode is set to 'Zoom'. To Pan along one axis, click and drag from the center of the axis. Double-click on a single axis to autoscale along that axis alone. First, head to the 'Edit' page of your plot by hovering on the plot's thumbnail and clicking on the 'Edit' button. This will redirect you to the [Chart Studio Workspace]((https://plot.ly/create/). When you are in the workspace, go to the 'General' section under the 'Style' menu. To change the drag mode, head to the 'Drag' property under the 'Interactions' sub-panel and set the 'Mode' attribute using the dropdown menu. To change the hover mode, head to the 'Hover' property in the same 'Interactions' sub-panel and set the 'Mode' attribute using the dropdown menu. To change the drag/hover mode and autoscale/reset axes uisng Mode Bar, please refer Mode Bar documentation.